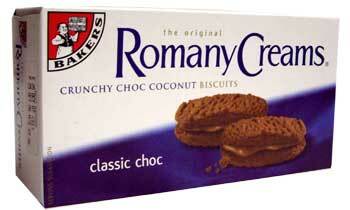 Crunchy chocolate coconut biscuits separated by a rich creamy chocolate layer. Biscuit: Wheat Flour, Sugar, Unhydrogenated Palm Oil, Desiccated Coconut (9%) (Preservative (Sodium Metabisulphate)), Maize Starch, Colour (E150C), Salt, Golden Syrup, Raising Agents (Sodium Acid Pyrophosphate, Sodium Bicarbonate), Cocoa Powder. These biscuits are the nearest thing & taste to the original gypsy creams which are no longer available, & haven't been for a long time. I bought 2 boxes & can tell you they lasted 3 days.